My first response to seeing the chapter headings in Geordie Williamson’s The Burning Library, Our Great Novelists Lost and Found was, ‘Oh good, I’ve read most of these authors!’ That’s not as facile as it sounds, because it means that since I agree with Geordie Williamson’s choices about these being wonderful authors who shouldn’t be forgotten, I can trust his opinion on the ones I don’t know and get hold of a copy of them quick smart! For example, Williamson claims that Australian Literature flowered briefly for only about 50 years in the 20th century and then died. He dates its birth with Xavier Herbert’s Capricornia in 1938 so his cut-off point would be at about 1990, after which, he says, that although literature in Australia still exists, it is ‘quite a different beast’. Well of course I don’t agree with that, and this blog is a testament to my belief that contemporary Australian authors are still writing a body of distinctive Australian literature. Click on the Australian literary fiction category in the RHS menu – that’s my rebuttal, ok? I’ve read Capricornia (see my review), and I have Poor Fellow My Country on my Miles Franklin winners TBR. (Update, see my review) Yes, he is ‘voluminous, incorrigibly didactic and often contradictory’ (p. 39) but I loved Capricornia for its vivid characterisation, its evocation of Australian bush life, and (like Williamson) for the way Herbert respects the world view of indigenous Australians. Williamson says that efforts by academics in our universities to break the [Australian national] canon in the name of greater inclusiveness and democracy have damaged the author who justified that canon’s existence more than any other. (p. 78). The extent to which White’s reputation has been trashed in his own country could be seen when a bunch of publishers recently rejected the Chapter Three of The Eye of the Storm as unpublishable. Well, if you read this blog regularly you know that I am an unabashed fan of Patrick White. I’ve just reviewed Happy Valley, but I’ve also reviewed The Twyborn Affair, (here) The Solid Mandala (here), and The Eye of the Storm (here). Voss is probably my longest review ever and it gets an extraordinary number of hits (4125 as of today, second only to *sigh* The Slap), so despite the gloomy prognostications, some people must indeed still be reading it. I’ve only reviewed Tirra Lirra by the River on this blog but I read The Commandant ages ago and I have The Impersonators on my Miles Franklin Winners TBR… Now I must find An Ordinary Lunacy too. It was Anderson’s first novel, and I love to read these first novels – the title is intriguing, to say the least. Anderson is, as Williamson says, a genius at creating ‘a rich and various cast of female characters (her blokes, neither rich nor various, are almost always hapless or cruel) whose common feature is a provisional sense of self’. (p. 89) I think that it’s that provisional sense of self that enables so many readers to engage with her novels. Many of us have taken that journey too. Sumner Locke Elliot: Years ago – long before I kept even a reading journal – I read Careful He Might Hear You when it won the Miles Franklin – but I’ve got Water Under the Bridge on the TBR too. It was the inclusion of this author that made me notice who’s not included. I liked Careful He Might Hear You – it was a popular Miles Franklin winner – and Williamson makes a convincing case for Elliot (including high praise from Patrick White for Eden’s Lost) but I am curious about why he is listed and David Malouf is not. Malouf gets a mention every now and again, but he doesn’t merit a chapter. Nor does Elizabeth Jolley, which is strange. Rodney Hall or David Foster aren’t included either, but while I suspect that they belong in this distinct tradition, I haven’t read enough of their work to know for sure, not yet. Amy Witting: I for Isobel is reviewed here on this blog, and I thought I had read everything else as well: Isobel on the Way to the Corner Shop, Maria’s War and After Cynthia – but Williamson tells me there is The Visit to chase up, citing Barry Oakley’s praise likening it to Chekhov. Olga Masters: Amy’s Children (see my review) is a wonderful book. Sue from Whispering Gums found Loving Daughters (Update: see my review) for me in an Op Shop, and I found The Home Girls at Brotherhood Books (Update: see a Sensational Snippet). This is the one, Williamson tells me that was Masters’ first book, published when she was 63, beginning a literary career that was to last only six years because she died of a brain tumour in 1986. (Elsewhere he notes the number of ‘late blooming’ female authors, the subject of one of Sue’s musings at Whispering Gums not so long ago.) ‘The collective lesson’ he says, of Masters’ fiction is the suggestion that ‘passion or violence need not be external, a matter of the public or the political, but may be internalised instead – lodged deep in the human heart’. (p 127) This is certainly true of Amy in Amy’s Children and her reaction to her own daughter Kathleen when she threatens to disrupt her mother’s plans. As of this week, I just happen to be listening to an audio book Keneally’s first novel The Place at Whitton (1964) and it’s fascinating. (Update, see my review). I don’t think he could write a novel set in a religious community in the same way these days, not with all the tragedy associated with child abuse scandals. My first Keneally was The Chant of Jimmie Blacksmith, (which I re-read not so long ago, (see my review); and then I read Schindler’s Ark a.k.a. Schindler’s List (which won the Booker in 1982); The Tyrant’s Novel (before I started this blog) and the audio book The Widow and Her Hero (see my review). I’ve read and reviewed the first of his Miles Franklin winners, Bring Larks and Heroes, (the novel for which Williamson says Robert Hughes owes an unacknowledged debt for its influence on The Fatal Shore) but I haven’t yet read Three Cheers for the Paraclete. (Update, see my review). These novels represent, Williamson says, Keneally’s early peak in his career, but I’ve also got some later works: The Great Shame, The People’s Train (update, see my review) and Family Madness on the TBR. These are IMO more popular works and less literary, written in what Williamson calls ‘the knockabout fluency and swiftness of his later style’. As you can see in my review I too was surprised by the resemblance to the style of Patrick White in Bring Larks and Heroes. I’m very interested in finding more of these early works. I discovered Randolph Stow when I began reading my way through the Miles Franklin winners – he won it for To the Islands in the second year of the award when he was only 22 (see my review). I was enchanted by Merry-go-round in the Sea (see my review) but as you can see from my review I was less keen on Tourmaline. Williamson analyses Tourmaline in some detail so The Burning Library is worth having for this reason alone, and I really like his statement that in Stow, ‘as in no other non-indigenous writer in our literature, landscape and mindscape are one’ (p 183) because this is so true of To The Islands. There is also some illuminating detail about Stow’s life which is fascinating to read. I love reading Gerald Murnane. Alas, Williamson begins with some references to popular culture the relevance of which remains elusive, and I suspect that some readers may not find his recommendation appealing. That would be a shame, but I know as well as Geordie Williamson does that it’s not easy to write anything that will persuade some readers to sample the delights of Murnane’s books. For what it’s worth, I recommend starting with Tamarisk Row (see my recent review), and then trying The Plains, Inland and the recent History of Books. (You can see my blundering reviews of these here, here and here). Barley Patch is waiting patiently on my TBR. (As with my Patrick White collection, I like to ‘save up’ my Murnanes). I have Marjorie Barnard’s bio of Miles Franklin, but that’s all. He won the Miles Franklin for A Horse of Air, but I haven’t found an affordable copy despite a serious hunt for it. (Update, read my review of a library copy that I tracked down). I have both his Miles Franklin winners on the TBR: The Unknown Industrial Prisoner (update, read my review) and A Woman of the Future. I’ll get to them soon, I promise. but I soon will because the ANZ LitLovers Book group has chosen The Watch Tower for its 2013 schedule, and thanks to Text Classics, it’s sitting on my bedside table! (In the meantime, see Sue’s review at Whispering Gums). (Update 9.3.13: The Watch Tower is superb, and on the strength of that I’ve just bought The Long Prospect (Text Classics). See my review). Lest Geordie Williamson be cross with me for turning his excellent book into a mere list, I hasten to add that I list them here only that you might start the hunt to source them. My collection, inadequate as it is, has taken years to assemble. My advice is to list them on your wishlist at GoodReads, download the app into your mobile phone, and head for the OpShops, the scruffy old ones that haven’t digitised their books for sale. These books are worth the hunt: as Williamson says, they form a ‘tradition, albeit a weird one’ ‘linked by eccentricity’ – which is probably why I like it. 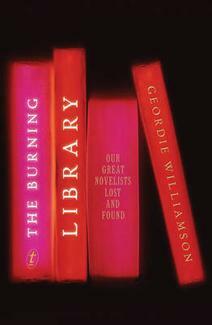 And in the meantime, read The Burning Library! BTW There are also terrific line drawings of the authors by W.H. Chong at the start of each chapter. Update Feb 4 2013: Ouch! There’s a rather scathing review of The Burning Library from Bernadette Brennan at the ABR, but you can only access it if you are a subscriber. Update Jun 16 2013 You can also read Kerryn Goldsworthy’s defence of the university’s role in all this at the Sydney Review. Sounds like a great book Lisa … I enjoyed your discussions of the authors you’ve read and what Williamson says about them. I was entertained by your comments on Murnane as I’m up late drafting my review of The plains, having written up a report on it for my reading group’s blog after tonight’s discussion. Few if any will read more Murnane after this experience, but I found it mesmerising and would willingly read more. (It’s taken me a long time to get to him). As for the books you haven’t read I loved Marjorie Barnard’s The persimmon tree and other stories (and have read it twice) but still have A house is built on my TBR. I loved The watchtower (which I reviewed a few months ago). And, I’m embarrassed to say that I haven’t read David Ireland either – he languishes on my TBR. But, no dedicated Malouf ? That’s intriguing. But, off to bed for me now … my Murnane review will have to be finished tomorrow. Ooh, I can’t wait to read your review of The Plains! And you know, that’s the exact thing about Murnane: reading about him is off-putting, he sounds too difficult, too obscure, too intimidating. But once you’ve taken the plunge, you’re hooked. I’m adding the URL to your review of The Watchtower now, but I won’t re-read it until after I’ve read the book. Do you have a post about Marjorie Barnard that I can refer readers to? Thanks Lisa … the review will probably be posted tonight. I’ve a lot to do today (am juggling three jobs at present) so plan to finish it tonight when I can get some headspace. I’m enjoying writing it but am nervous at the same time because he leaves you with more questions than answers. As for Barnard, unfortunately I’ve only referred to her on occasions because both times I read the book were before I started blogging. However Tony of Tony’s Book World reviewed it 2 or 3 years ago after I recommended it to him. You might like to link to his. Thanks, Sue, I’ll chase Tony for the link! Thanks a lot for this summary Lisa. It stirred me to fill in some of the gaps – I’ve just ordered I for Isobel and Loving Daughters. And I agree with you that the omission of David Malouf is surprising. No Elizabeth Jolley? that really does surprise me. Sounds like a great book. I, too, respect Geordie Williamson’s opinion. I tend to agree with the author. The great Australian nationalistic novels, based on a uniquely Australian character, probably reached their peak with Donald Horne’s ‘The Lucky Country’. I realise the tradition continues, with writers such as Tim Winton, but it is dying out. Australia is no longer so idiosyncratic as it was, in language and customs. Multiculturalism has seen to that. These new Australians are not going to become ‘diggers’, ‘cobbers’ or even mates. Customs from Vietnam, for instance, don’t translate into a bush Christmas, and words like’s strewth’ and ‘gawd’, are well past their use-by-date. I have no doubt there are still outposts of Australiana in outback, isolated areas – but the Australia of today is not the Australia of yesterday – thank gawd. I hope I’m not representing the author, but I think his argument was that there was a critical mass of Australian writing at that time, whereas now, many younger writers are writing for an international market. He also talks about how that identifiable Australianness was bush-orientated, which made sense because at that time, Australia was not city-centric as it is now. I guess it depends on our definition of Australian: while there are other multicultural societies like ours, I think there is something unique about Australian society and I find it in the books I read and review here. That’s especially true of our indigenous authors of course, but not only their writing: the book I’m reading at the moment, Red Dirt Talking by Jacqueline Wright couldn’t have been written anywhere else but Australia, and if I excerpted a chunk of dialogue without saying where it was from or anything about it, everyone would still recognise it as Australian straight away. I would definitely not call you an ‘ordinary reader’ Lisa! You not only read a great deal but you reflect on the books and draw interesting comparisons etc This book makes me realise how shamefully ill-read I am when it comes to the Australian canon. HI Annabel, I’m ordinary in the sense that Gerodie Williamson means it: he means non-academic people, people reading for pleasure not because they are required to for work or study. And what he’s hoping for is that when orrdinary readers can get hold of these books (and that’s the hard part) they love them, love them every bit as much as they love the stuff they read from the US and the UK, and even more so because these books are Australian, they’re about *us*. And then what we ordinary people need to do is to tell other readers, because that’s how the message is shared. Don’t worry about being ‘ill-read’ – at your age I could have said that too. There’s no rushing being ‘well-read’ and there’s no magic list that you can work through to get there. Whatever you read, there will always be gaps – I only have to look at Tony’s Reading List to see how ‘ill-read’ I am in German Lit, for example, or at Winston’s Dad to see how little translation I have read. I only have to decide on a new travel destination to find that I know nothing about the literary culture of that place. But hey, who cares? We read for pleasure, we chat about our books here and at GoodReads, and our choices go where serendipity leads us! Yes, I see what you mean about the ‘ordinary’ part. And about the other part too. I like to think I am relatively well-read in my own chosen niche. But my goal for next year is to read more works in translation. What does he mention? I’m trying to work out what kind of pop culture you’d use to introduce Murnane, and if it’s not something to do with horse racing then I’m coming up blank. Oh dear, Lisa – I’ve never watched it, but it was a very famous (American) television show, concentrating on the life of a mafia boss and his family. Also very highly acclaimed. American, you say? And Mafia too? Very odd. I know of the show but haven’t watched it. One day I’ll get this book, and see how he fits it in there. It made absolutely no sense to me at all. Excellent! It’s such delicious book, I love getting it down and re-reading his thoughts about books as I read them.